This is a vintage Thumler’s “Model A” rock tumbler from the late 1950s that was originally sold with paint cans instead of tumbler barrels. Thumler’s has been using this same basic design for many years and some of the current parts will fit their older tumblers. 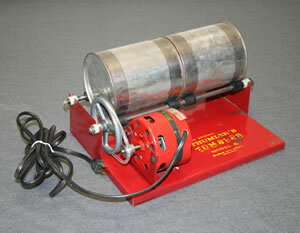 See our selection of Thumler’s Tumbler parts. We sell parts for some of the current-model rock tumblers manufactured by a few companies: Thumler's, Lot-o-Tumbler and Lortone. We do not sell parts for any other tumblers. We are unable to tell you if the parts that we sell will fit tumblers made by other manufacturers. All information that we have about parts for other tumblers is written below. Please read it instead of writing to us. Thank you! For other brands of tumblers that are still in production the best place to obtain the parts is directly from the manufacturer. Some of these manufacturers include: Diamond Pacific, Covington Engineering, Mini Sonic, and Natural Science Industries. Rock tumblers have been manufactured since the 1950s. In that time dozens of companies have invented tumblers, manufactured them, and then went out of business. It is impossible to get parts for most of these tumblers. If you need a belt for an extinct tumbler, you might be able to find a similar-size belt at Stock Drive Products. They also sell bearings, pulleys, motors and other drive train parts. They have illustrations on their website to assist with belt sizing. 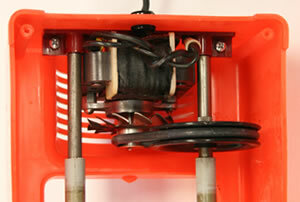 Grainger is another source of stock motors, belts, pulleys and bearings. 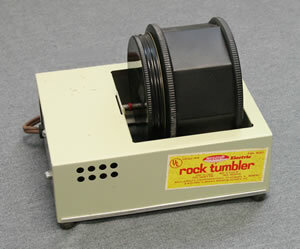 An external view of a Skilcraft rock tumbler from 1972. Buy something like this if you collect old toys or old rock tumblers. If you buy it expecting to run it you might not be able to find replacement parts and your money might be better spent on a new tumbler. Lots of people purchase old rock tumblers at online auction sites, flea markets and yard sales. They think that they made a great find. Then, when they try to run the machine they discover that the belt is old and cracked, the motor is worn out, and the bearings are in bad shape. Most of these tumblers never get back into action. Why? They need an impossible-to-find part. These tumblers end up being resold and resold again because the buyer can't find the parts needed to get them running again. We have seen the same vintage tumblers offered on Ebay by several different sellers. They couldn't find a part so they sold the inoperable machine to someone else, who couldn't find a part and sold it to another person who could not find a part… you don't want to be the next guy in that chain. A view inside of a Skilcraft rock tumbler from about 1972. As with many of the rock tumblers obtained at yard sales the motor is rusted and you might get it home and discover that it does not work. 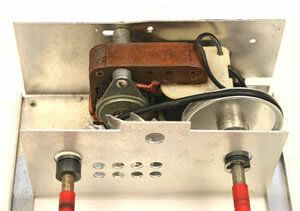 The belt, shaft liners and other plastic parts are likely to be old and deteriorated. If you purchase a tumbler that is not in current production then finding parts for it is going to be very difficult or impossible. Some popular brands of extinct tumblers include: Scott-Murray, Rapco, Hillquist, Little Gem, Victor, Star Diamond and many others. We don't know anyone who sells parts for these tumblers. View inside of a vintage Rapco "Tumble Stones" rock tumbler from about 1972. Parts for these tumblers are really hard to find. We don’t know of any sources for these parts. If you need a belt, motor, pulley, bearing or other drive train part for an extinct tumbler, you might be able to find something useful at Stock Drive Products. They have illustrations on their website to assist with belt sizing. Grainger is another source of stock motors, belts, pulleys and bearings.